You remember that I don’t do extreme frugality very well; extreme frugality can ultimately be very wasteful, pointless and even unpleasant. I am a firm believer in being a frugal artist, however; this means that we decide whether something is a worthy saving or not by taking into account different factors, on the basis of broad concerns including quality of life and thinking about the long term. Another thing that I didn’t do until about four years ago was cooking: you could see me in the kitchen only making coffee, a quick sandwich or pouring milk over a bowl of cereal. My culinary dexterity was limited to about three dishes that I cooked to perfection – long albeit irregular practice I suppose. Then I was suddenly all about cooking; and I suppose having discovered that we are in quite a bit of debt really helped. I stopped seeing cooking as a waste of time and effort – after all hours of slaving at the stove didn’t last thirty minutes on the table – and saw it as a way to save and rationalise our spending. From this to home baking was just a small step; and my good friend Elaine from Mortgage Free in Three who encouraged me all the way. At the beginning was a bread-maker; now I make some of our bread by hand. Much cheaper; it depends on the type of bread, its quality and where you shop but making your own bread is between two and three times cheaper than buying it. It is much healthier. Well, it is healthier to the extent to which bread is healthy at all. Then again we all love bread so the ‘relative matters’. Even bread sold in expensive shops contains at least twice more ingredients than it should; but more about this one later. It is so therapeutic. Kneading dough feels great at the end of a day spent behind a key board or on my feet teaching. Increase the pressure a bit and imagine that you are ‘doing’ the person who annoyed you so much earlier. Sounds bizarre but it is so much cheaper than a shrink! It is delicious. This doesn’t need much writing, really. Taking the freshly made bread out of the oven and waiting for it to ‘breath’ for five minutes is heavenly. Why? Because this five minutes are the only time now that my almost teenage son looks at me with a mixture of adoration and plea. Now time for an example. 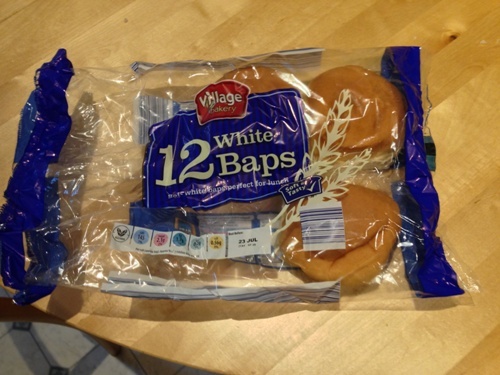 Look at this white baps (buns) bought in the supermarket. Before I saw these shrivelled buns and tasted them, I couldn’t understand why Michael Douglas lost it in the movie Falling Down (you know, the movie where he got so mad at McDonalds that he started shooting and didn’t stop for sometime). And these are the buns I made for the same occasion (well, the factory ones were for ‘just in case’). See the difference? One could taste it as well. Would it surprise you to hear that I don’t know what about half of these ingredients are; and what are these doing in bread that is being sold in the shop. 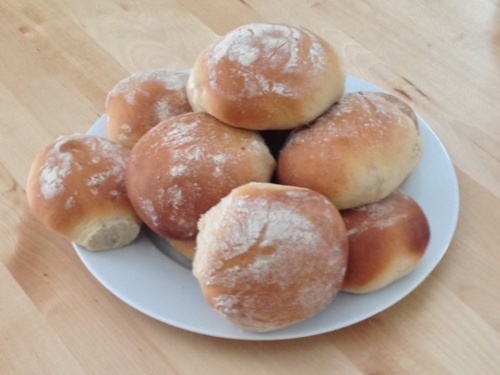 For the buns I made I used a recipe by Paul Hollywood and there are only five ingredients in them. So, what do you think: frugality or folly? Not only does my wife make bread for our own consumption, but she also give sit as a gift around the holidays. Her breads are amazing! @Krant: Swapping some recipes, may be :). I don’t really have to tell you how I feel about that, Maria. Cooking has a satisfaction way beyond being frugal. The taste (especially of home made bread) is just not in the same class as the store bought. It gives me a sense of having done something useful. My working life was spent producing reams of paper (towards the end, gigabytes of ‘information’). It was always satisfying to actually make something which was useful and gave pleasure. It still is. @Pat: There, there. This is exactly how I’ve started feeling. And somehow, making bread becomes me; it is another matter entirely with sweets and cakes :). I only bake sweets, never bread (not because I don’t want to, but because the few times I’ve made bread have turned into disasters). My partner eats a lot of bread because he lives off of sandwiches, so I suppose if he made his own bread he’d save a ton of money (probably at least $5/week, he eats that much bread). @Daisy: I am the other way around; can’t bake cakes for some reason. It is all well and then they collapse. Bread…well, I seem to have a talent for making bread. So you get the bread fresh, with ingredients you know and trust, you have fun doing it and the family enjoys…sounds like food-nirvana! @Simon: Food-nirvana? I love it! Thanks for stopping by and yes, kids love baking and all kinds of mess :). I remember waking up to my mother’s baking when I was young and it’s the most pleasant and memorable moments of my life. I think it’s more than therapeutic for yourself and for your family. Yours look so much nicer than the store-bought ones. I love that – “baps”! Never knew that was a britishism. I’ve been baking my own french bread and pizza doughs lately. It is enjoyable to make the dough, and knowing you did something awesome yourself is cool. I do struggle with admiring my work and thinking “I just spent 30 minutes to make a couple loaves and I could have spent $2-3 at walmart or the grocery store for something similar”. The cost savings aren’t quite there for me, but having fresh made bread you created with your own hands is a very empowering feeling. And the smell of fresh bread permeating the house can’t be bought for $2-3 at walmart! My wife loves to bake. She even has a bread dough kneading machine. My favorites are zucchini muffins and chocolate crinkle cookies. The zucchini muffins are actually pretty lean and healthy. She uses applesauce instead of butter. And the zucchini comes from our garden. I love homemade bread! Double bonus the whole house smells delicious when it’s baking. I think it’s worth the time to make it yourself (especially to avoid ingesting all those chemically ingredients-I don’t even know what most of those are, on the store bought variety). I used to like Domino and the others but since I started making pizza at home I find them disgusting, and they really are overpriced. A pizza in Italy, served at a restaurant costs rarely more than 7 euros, and after all it is just a piece of flat bread with little toppings, why would you charge the price of a meat meal for it? I haven’t found a pizza stone but have a large tray to make a square pizza that is almost as big as the oven. Generally we do vegetarian with basil from the garden, and fresh goat cheese. No Parma ham around here and the cold cuts are pretty low quality. If you put good cheese it comes as expensive or more than a pizza in a restaurant but 100 times better.